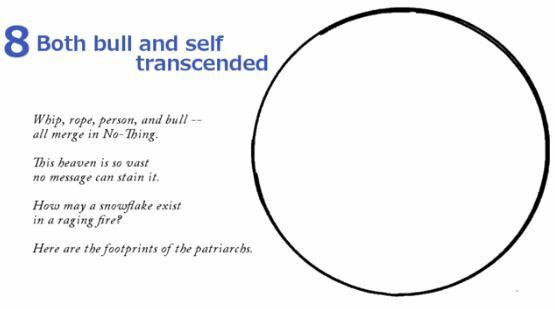 "10 Bulls" - The 10 Secret ZEN Steps Straight To ENLIGHTENMENT! 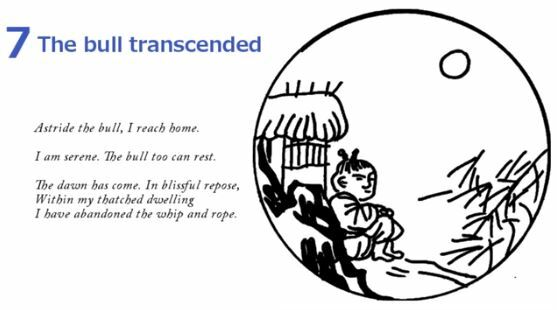 “Ten Bulls” is, in tradition of Zen Buddhism, a series of short poems and accompanying pictures that are intended to illustrate the stages of a Mahayana Buddhist practitioner’s progression towards enlightenment. Mahayana Buddhism teaches that enlightenment can be attained in a single lifetime, and this can be accomplished even by a layperson. 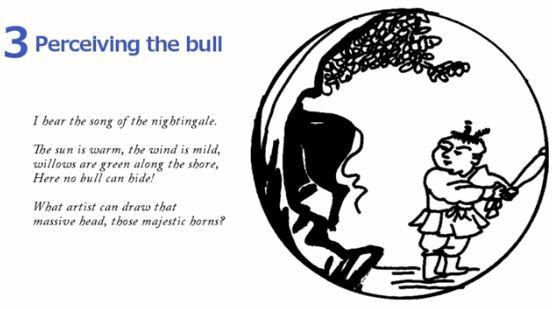 The pictures, poems and short pieces of prose tell how the student ventures into the wilderness in his search for the “Bull” (or “Ox”; a common metaphor for enlightenment, or the true self or simply a regular human being). Even though this was written for ancient times its wisdom can still be implemented in today’s society. 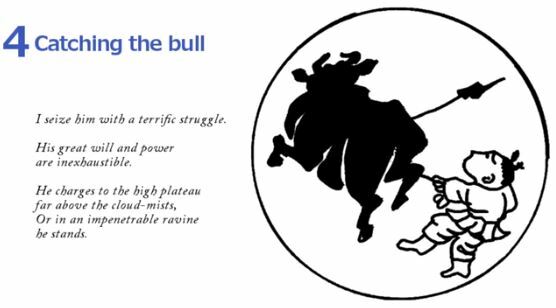 That’s why I explained each of the 10 Bulls below so it makes sense in today’s world. 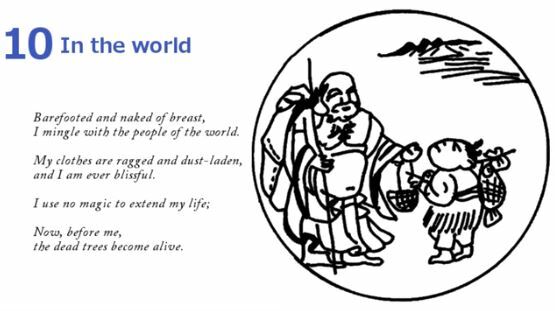 Watch the video and then, read what each of the 10 short poems mean. Many people in the world are stuck on this level. 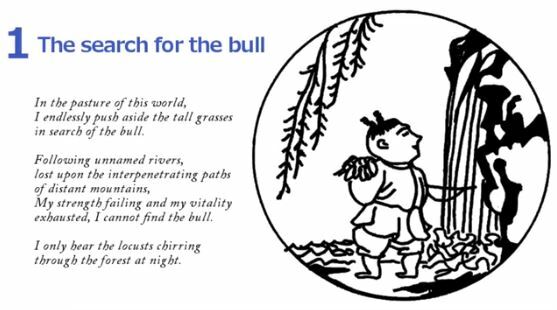 They feel something missing, they want to find the truth, they search for the “bull” endlessly in all the wrong places until they are too tired to continue. It’s very easy to get fooled that there is no “bull” on this level. Suddenly, in the midst of the information that is forced down your mind you start to see a divine pattern. You notice the illusions and false realities created to keep you busy chasing ghosts. You start to perceive the “bull’s” footprints all around you. You realize that the “bull” actually exists and you are onto it. Following the footprints you end up places you never thought you would go. You discover the magic and beauty that was hidden in plain sight. You start to see the real world all around you. You sort out the clues you’ve found along your way and, finally, you perceive the “bull” standing divinely in front of you. You try to embody your true self, to live through your true potential, to see the truth, but the “bull” is a restless beast. Just when you think that you’ve caught it the “bull” changes direction. It drags you from one extreme to another. You face emotions long forgotten, you get lost, exhausted, until finally you surrender to the “bull” so it catches you. Now you start to train. It’s like learning everything from beginning. You face the world with the “bull” and it doesn’t take much for the world to bring you to your old habits. However, you train. 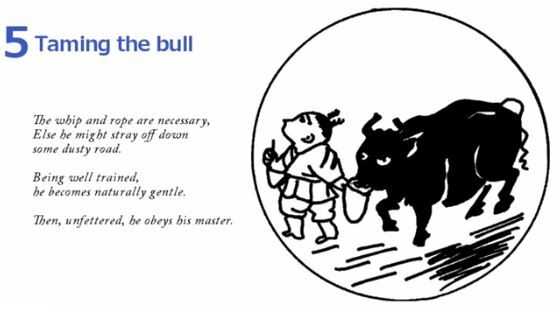 At first the “bull” is aggressive but soon you tame it to be gentle. You keep taming the “bull” and learning how to live in the world being the real you. You’ve trained the “bull” in such a way that you have fun with it. You are more free with it than you ever were by yourself. 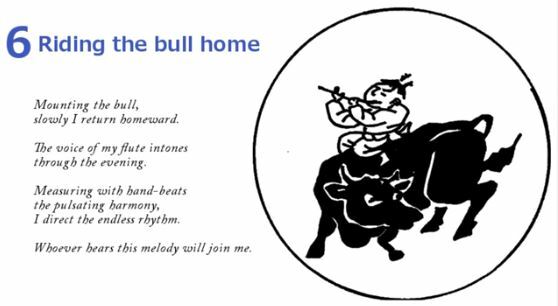 You sing, dance, laugh, play with the “bull” and you are almost immune to the world around you. You’ve discovered your own frequency and the “bull” is in harmony with it. You are its master. It’s time to bring it home so everyone you love can get to know it. You discover your home. You are serene. Peaceful. The “bull” can rest too. The need to train the “bull” has faded. You are free to be free. You accept the “bull” as it is and you as you are. You realize that the “bull” too was only an illusion, but a helpful one created from your own heart. Everything is an illusion. Everything is one. You discover place inside you where everything merges into no thing. This is the place that the “bull” came from. This is the nexus of you. It’s the purest version of you and nothing can stain it. It’s your own light. Your home. Your true potential. Your soul. 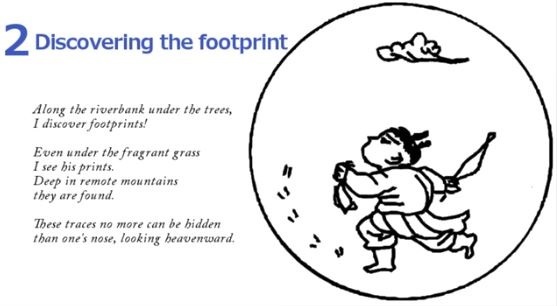 You perceive footsteps from ancient wisdom there. You bath in your own light. You become your own light. You reach your own heaven and discover The Source. It’s the most beautiful place you’ve ever imagined. It was always with you but you were unable to see it. You think if only you were blind and deaf from the beginning so you wouldn’t have been fooled by the outer world. But then you realize that you’ve been fooled by your own inner world, not the outer world. You realize that going to the outer world from this place here was the greater plan all along. Coming from your own heaven makes you divine. 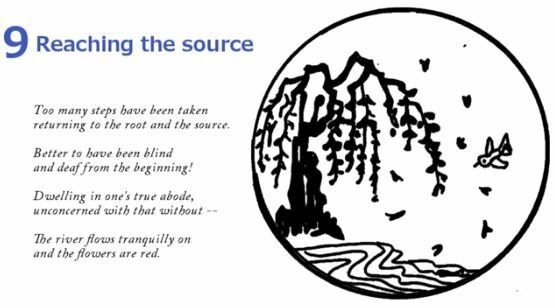 You are connected to the wisdom of The Source. You walk the world and others think you do miracles simply because you are you. Simply by your presence you make the world a better place because the heaven you come from is projected upon the outer world through your actions. You bath the world with your light. You are enlightened.